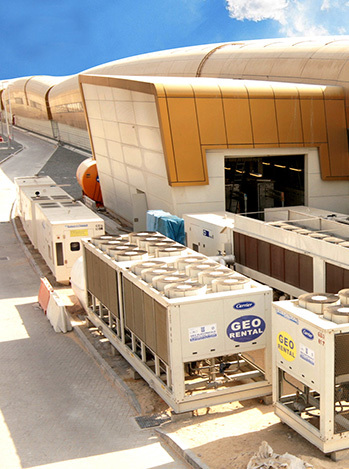 ENERGIA is a leader in providing rental temperature control packages and temporary district cooling solutions. Our cooling packages are used to cool and maintain the temperature of facilities in a range of environments from music events, to construction, production, shut-downs and to military bases in the middle of the desert. Chillers are available from 60TR to 300TR and can be configured to meet the most demanding requirements and environments and all installations have the added benefit of remote monitoring options should it be required. ENERGIA also provide mobile energy transfer stations, air handling units available in 100 tons to 200 tons, skid mounted heat transfer units, and multiple air conditioning units 20TR, 28TR & 50TR (Packaged Air Conditioning Units with Power) available in different capacities for various cooling applications. ENERGIA’s range of solutions and expertise in temperature control projects allows the customer to receive a one stop solution for all their temperature control requirements.